We are used to difficult grinding jobs – it’s what we do – but sometimes one comes along which is just that little bit more demanding. That was the situation when we were asked to grind three identical components to three specified finishes: 0.2Ra, 0.4Ra and 0.8Ra. As Paul Turner explains; “Usually, the specified level of finish is effectively an upper limit of permitted roughness. In this case the situation was different, the finish on the 0.4Ra component could not approach 0.2Ra, and the finish on the 0.8Ra component could not approach 0.4Ra.” So a component with a “better” finish would be rejected. Our customer wanted to test what finish was necessary to achieve the desired mechanical objective, if there was no functional necessity to specify a finish of 0.2Ra on production-run parts, then cost could potentially be saved by specifying a finish of 0.4Ra, or even 0.8Ra. Achieving exact finished roughness is commonplace using EDM technology, where the parameters of the machine exactly determine the finish at each specified power level. However, with grinding, due to the number of variables involved, this is not the case; decisions include not only the choice of grinding wheel, the grinding fluid, the mounting of the wheel, feeds and speeds, but many more. Not surprisingly, grinding is still sometimes considered a “black art”. In the event, delivering the controlled “rough” finish of 0.8Ra proved the most challenging task. The geometry of the components was extremely simple, 50 mm diameter, 20mm deep, in case hardened steel, so achieving the 0.2Ra finish was really “business as usual”, with controlled grinding speeds, fine wheel dressing, etc., but achieving the 0.8Ra finish required considerable experimentation before the desired result could be consistently achieved. 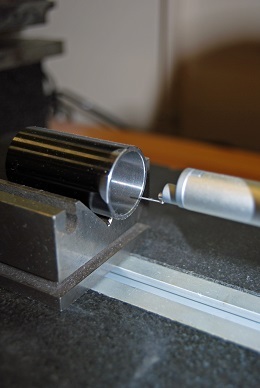 Naturally, with a task such as this, suitable Metrology equipment to check the final finish is vital. We used our high-accuracy Mitutoyo Surface Test SJ-401, technology that can measure curved-surface roughness by removing the radius-effect with a filter, and then process the data as if it was taken from a flat surface. Those measurements were then statistically processed by the machine and the data displayed and printed in a variety of different formats, from the purely numerical to histograms and charts, enabling us to provide the information to the customer in a suitable format for further analysis in the light of the components’ performance when tested.